This post is sponsored by Wholesome!® – we used their Organic Blue Agave in this recipe, and many more, because YUM! Okay, first of all, let’s pause for a moment of reflection on the fact that this is a BRUNCH CAKE. Really the main word that comes to mind is LUSH. It is cake without being *cake* while still being cake. Do you feel me? This is very much a brunching wow-factor that doubles as second breakfast if you need brunch vibes in your life on a Wednesday. And so usually the question that filters my decision to post a recipe or not is: IS THIS A RECIPE THAT I WOULD ACTUALLY MAKE? I mean, for sure, I have a level of appreciation and respect for beautiful food. Like the fancy cakes of Instagram and cupcakes from our local little Copper Hen and even this fruit pizza that my sister makes just to shame me, I’m sure of it. But friends, I have somewhere between 0 to -100% interest in spending hours, minutes, or really even seconds decorating food. I just don’t. That part of my brain is broken. Maybe it’s a vulnerability complex – I’m not good at it so I don’t want to try? or maybe it’s just plain and simple – that I don’t want to do it. I mean, HELLO. Can we get to the eating part already? This might be a good time to mention that, considering I was born without decorating and fancy food abilities, it probably looks as if this lovely brunch cake may have taken me years to put together. Good solid YEARS of my life. I’m not a fancy food girl. This is not a secret. We know this. So this princess cake must have been my life’s work up till this point, right? The truth of the brunch cake? ONE HOUR is the truth of this brunch cake. 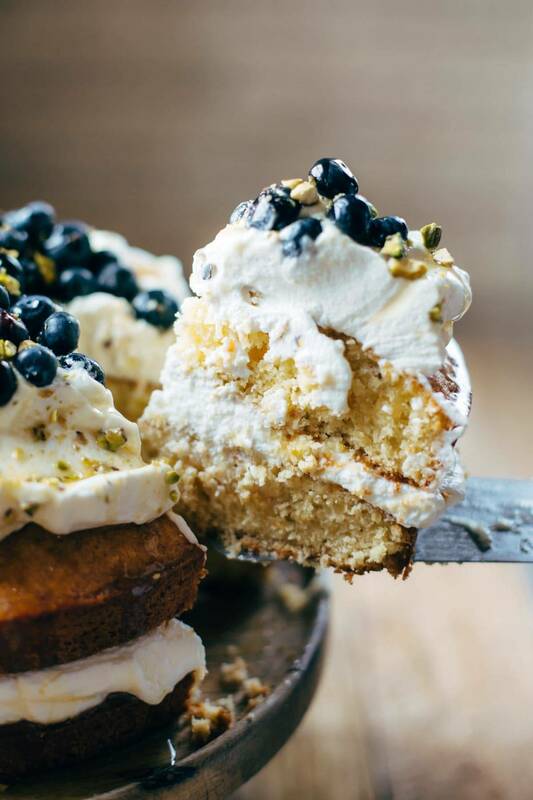 Plus or minus a little time depending on how much whipped cream you eat out of the mixer and/or how many finger swipes through the whipped cream cake layers you need to try to cover up. But generally speaking, this is no more complicated than making quick bread. Guys, in my journey for a regular person’s pretty cake, I tried so many different things to make this cake amazing and *almost literally* sparkly and Instagram-worthy like #cakegoals, and then (here’s the not awesome truth) I got legitimately mad at all of them for being too slow and particular and tedious. That was a SUPERfun weekend. Don’t you wish you would’ve been in the kitchen with me? I think they call it a hot mess or something. The five “test” brunch cakes and various decorating attempts of that weekend shall no longer be mentioned on this blog. So I eventually channeled my frustration with the lush cake life and landed on something so simple and so stunning and straight up EASY that also happened to completely blow up my brunch game and make me look like I had skillssss, man. While being still A RECIPE THAT I WOULD ACTUALLY MAKE. ohmygosh. On point and on brand. 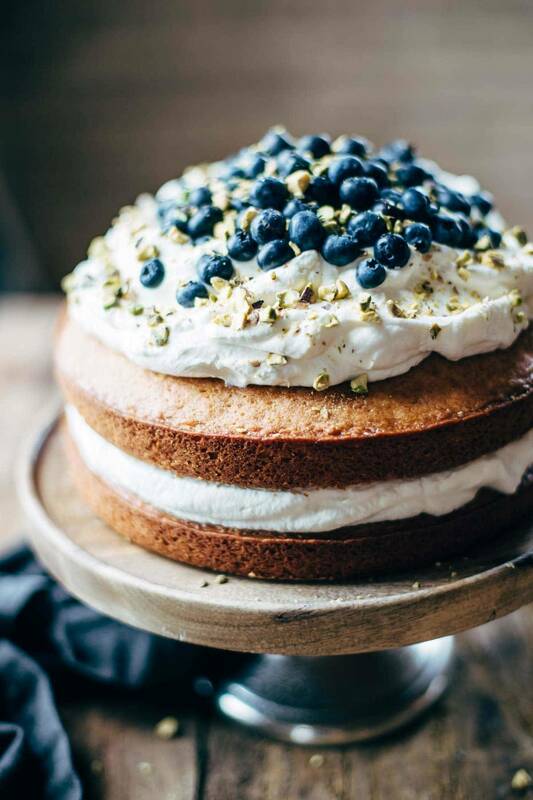 AMAZING cake made with olive oil and a whole orange. I can die happy. More agave on top to look like you know what you’re doing with cakes. The beauty of the whipped cream layer is you just sort of plop it on in big swathes and give it a swirl with a spatula and WHOA. It looks amazing. THIS IS MY KIND OF DECORATING. 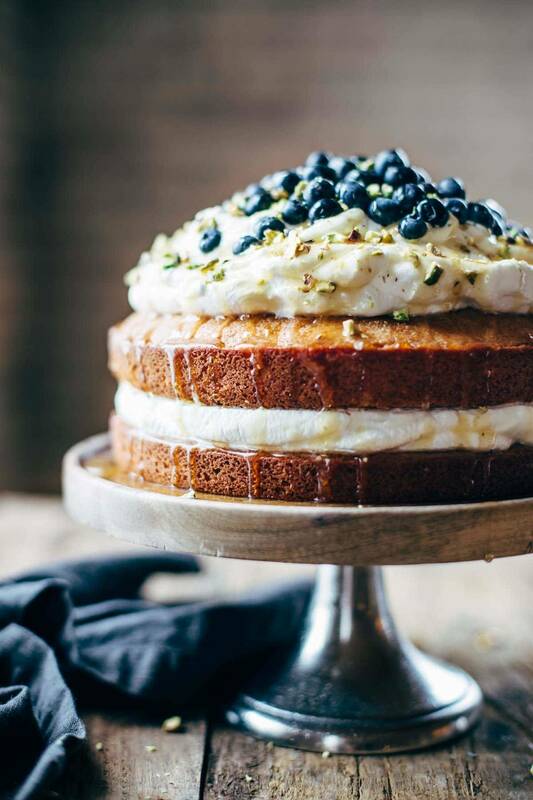 Same with the rest of the crew – blueberries, pistachios, and agave are color and texture magic all on their own. Friends, when you do make this, I fully expect pictures. Tag me, snap me, email me, do what you need to do. For the heart and soul of this blog, I need to know that I’m right in saying that this is a faux fancy cake that people will actually make. And adore. Also guys. 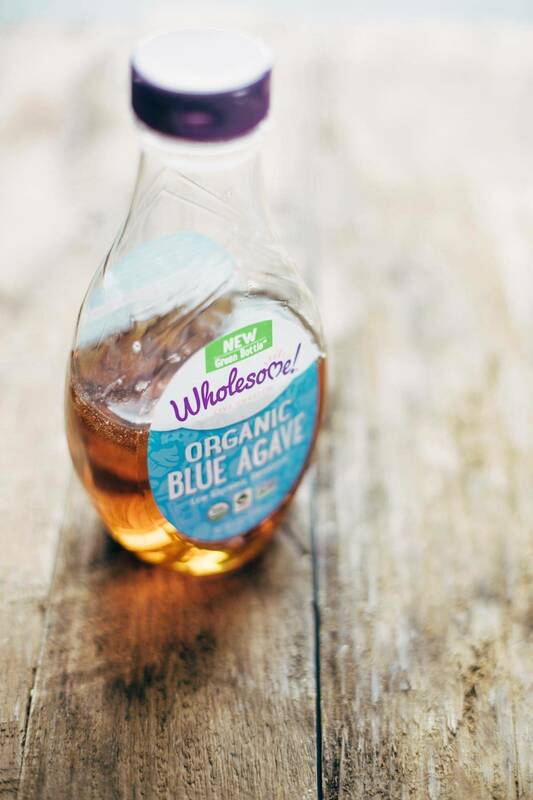 We’re using Wholesome!® Organic Blue Agave in this recipe which is our favorite. Have I mentioned that before? Their organic sweeteners that are not only practical and accessible (s/o to TARGET), but they are also non-GMO and fair trade. Win win! The adults have officially left the building. PREP: Preheat the oven to 325 degrees. Line two 8 or 9-inch round cake pan with non-stick spray or parchment paper on the bottom (I cut mine to a circle so it would fit right in there). ORANGE MIXTURE: Place the oranges and agave in a food processor and pulse until a pulpy juice forms. Set aside. 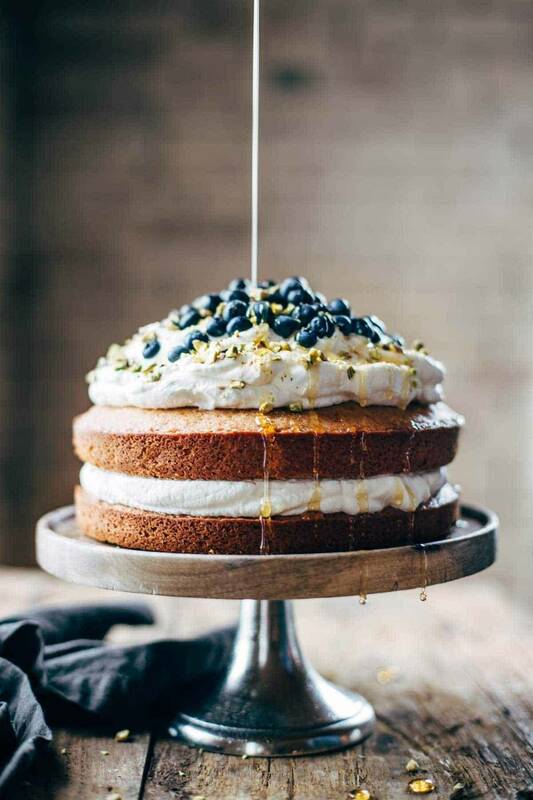 CAKE: Whisk the sugar, eggs, and olive oil and mix until incorporated. Stir in the orange juice mixture. Add the flour, baking powder, baking soda, and salt and stir until just combined. Transfer batter the prepared cake pans and gently knock the bottom of the pan on the counter to eliminate bubbles in the batter. Bake for 35-45 minutes or until the tops spring back. Let the cake cool to room temperature to avoid melting your whipped cream layers. WHIPPED CREAM: Using an electric mixer, beat the heavy whipping cream until light and fluffy. Fold in the agave. Spread whipped cream on top of the first cake, staying close to the center so you don’t get whipped cream overflow. Then gently place the second cake on top, and top with another layer of whipped cream. Cover with blueberries, pistachios, and agave. I also took the juice of a few oranges and simmered it down into a thick syrup, whisked with a tiny bit of agave, and poked holes in the finished cakes and poured my “orange syrup” over the cakes. Makes it extra moist and amazing. Totally worth the addition of one extra step between baking and frosting. In general, I like this cake refrigerated! Especially once it’s had a soaking of orange syrup if you decide to go Next Level with the whole thing. 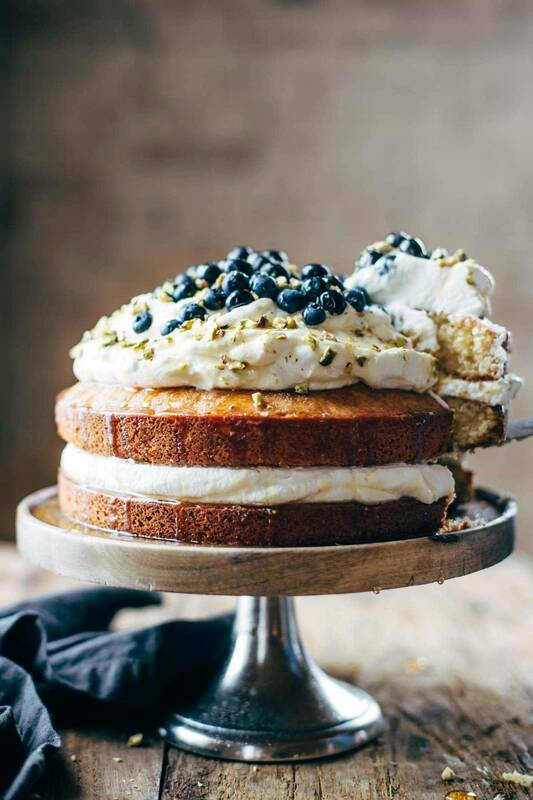 The post Blueberry Orange Brunch Cake with Agave and Pistachios appeared first on Pinch of Yum.